Physical copies, digital downloads and streaming are available at your favourite outlet HERE. April Verch is known as one of the most esteemed fiddlers and stepdancers of her generation. On Once A Day, it’s her voice – a sweet and gossamer instrument – that adds a distinct personal flair to her homage of 1950s and 60s classic country. 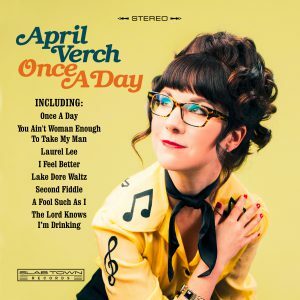 Verch, an Ottawa Valley, Canada native, grew up on the sentimental songcraft of this iconic era, and her deep appreciation of the source material is clear in her careful attention to songwriting and phrasing. Songs penned by greats such as Webb Pierce, Loretta Lynn, The Louvin Brothers, and Connie Smith are bound together by a masterful studio band of country veterans, including steel guitarist Al Perkins (Dolly Parton, Emmylou Harris), guitarist Redd Volkaert (Merle Haggard) and fiddler Kenny Sears (Mel Tillis, Grand Ole Opry). Recorded in Nashville and produced by Doug Cox, the arrangements on this record breathe—a rare example that reminds us that less is often more. With 12 albums and nearly two decades of touring under her belt, Once A Day reminds us of Verch’s incredible range, and is sure to delight fans of classic country and its relatives.